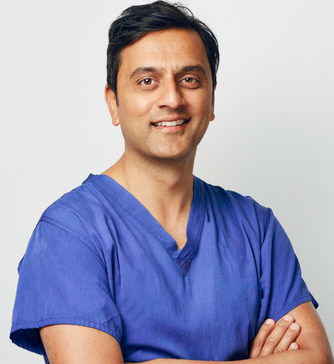 Mr Amyn Haji was appointed as a Consultant in Colorectal and Laparoscopic Surgery at King’s College Hospital NHS Foundation Trust in 2011 and is currently the Clinical Lead for Endoscopy and Colorectal Surgery. His clinical practice primarily consists of laparoscopic colorectal surgery, advanced colonoscopy and laparoscopic hernia surgery. Mr Haji graduated from the University of Cambridge in 1999 where he was awarded a Bachelor of Medicine and Surgery degree and a Master of Arts. Mr Haji was admitted as a Fellow of the Royal College of Surgeons of England in February 2010 and received his certificate of completion of training (CCT) in March 2011. His research and clinical interests are in utilization of high frequency colonoscopy ultrasound in the staging of colorectal polyps and cancer. He completed a fellowship in advanced colonoscopy with Professor Kudo at Showa University in Japan in 2010 and since then has developed a practice of endoscopic mucosal resection and endoscopic submucosal dissection in the treatment of colorectal polyps and advanced endoscopy techniques. He also introduced Peroral endoscopic myotomy for Achalasia to the United Kingdom I 2013 and is the leading expert in this field in the UK.